Commence holiday shopping! When much of the world is enveloped in bright holiday lights and flurries of color, people like to take advantage of all of the deals and steals going on. So what are we doing here at iJDMTOY? There are tons of holiday sales going on around here, but we’re pleased to introduce free shipping on orders over $75! On top of that, orders over $120 will get an additional 15% off. Holidays don’t necessarily mean that you have to spend a ton of money, so whatever savings on top of savings is a plus. We’re also doing a mystery savings bonanza where we unveil a special deal like HID Conversion Kits every day for 12 days on some of the most popular items that we’ve handpicked to give you guys a great sale on! Check into our site daily to see what we have in store and maybe it will be a cool set of LED lights that you’ve been eyeballing for a while. 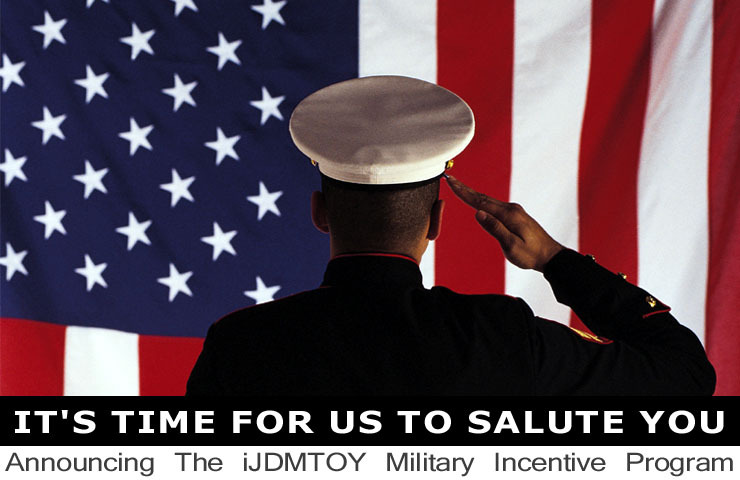 Here at iJDMTOY, we are pleased to announce our Military Incentive Program, which offers an 12% off discount for those in the military. 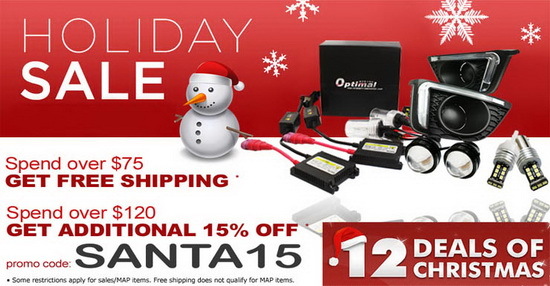 The 12% off includes hundreds of items such as LED lights, LED bulbs, and HID Conversion kits. Some of our items are even already discounted and you could stack the 12% deal on top of that for an even better bargain. Simply create an account on our website using your military email place an order. Afterwards, contact our customer service and they will gladly do a price adjustment on your purchase. -12 inch 32-SMD LED Knight Rider Scanner Lighting Strip Bar for Car Interior is a nice way to give the interior of your car that nice glow in the night. You can put this light anywhere in the interior like the dashboard, or trunk as a sort of accent light. -CAN-bus 6418 C5W LED bulbs with built-in load resistors for license plate lights on European cars like Audi, Porsche, BMW, and Volkswagen. These LED bulbs are error free to give your license plate a great glow. -Audi Style Switchback LED Strip Lights for Headlights are a great way for people to get the Audi look without the Audi price tag. These strip lights have a special tube design where you won’t see each individual LED, but rather a smooth uniform output. Thank you for serving our country and enjoy your new LED lights. 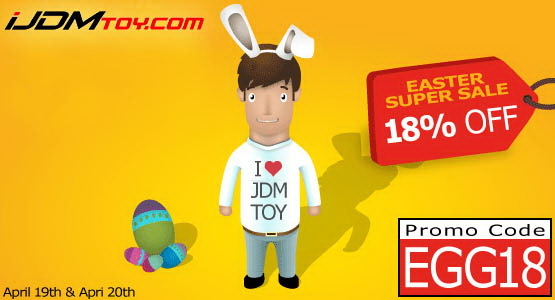 Here at iJDMTOY, we are celebrating Easter with an 18% off sale! We are having this sale this weekend only, from Saturday, April 19 2014 to Sunday, April 20 2014. This sale includes LED bulbs, HID conversion kits, LED lights, and more! Use code EGG18 for tons of savings! Some items are even discounted already so you can have a better deal! 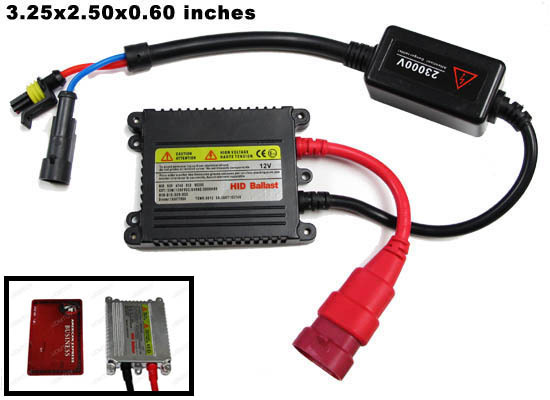 Be sure to check out our new LED arrivals! -Super Bright LED Bulbs for 2001-up Volkswagen Jetta Daytime Running Lights. Spice up your Jetta with new LEDs and make it unique on the road. -LED Brake Light DIY Conversion Kit for Scion FR-S, Scion tC, Subaru BRZ, Nissan 370Z and more! Where can you get safety and style with an additional 18% off? -Super Bright Bolt-On LED Lamps for License Plate Lamps or Reverse Lights are also a great option because they are universal fit. Get one for yourself, your sweetie, your buddy, and everyone else! Act fast to snag the LEDs of your choice! Maybe you’ll find something you love in the Daily Deals section too. Have a happy Easter! 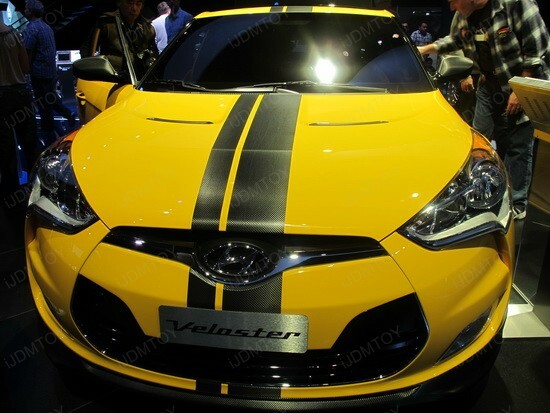 Here’s the all-new 2012 Hyundai Veloster, which is customized with Carbon Fiber Sheets. Actually, we visited the 2011 Los Angeles Auto Show and spotted this beautiful car at the Official Hyundai booth. When we took a closer look, we couldn’t miss the very-well applied racing stripes from Carbon Fiber Vinyl. 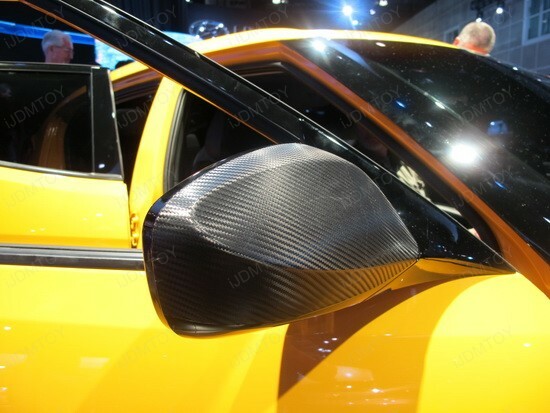 The side mirrors are wrapped in the same Carbon fiber Sheets, too. These simple modifications give the vehicle very modern and sporty look and add more style to the practical and yet adventurous sporty coupe. However, you can achieve the same stunning carbon effect even if you don’t have the latest vehicle on the market to work on. All you need is to look for some quality Carbon fiber Sheets and here’s where iJDMTOY comes. This is a great way to get that awesome carbon look without the high cost of actual carbon fiber material. Get the most popular 3D Twill-Weave Carbon fiber sheet and start working on your tuning project. Application is extremely easy – first you have to clean up the surface thoroughly, then apply the sheet on the surface, spread it out and eliminate all the air bubbles. Here’s a hint: you can use heat gun to get rid of all the bubbles. The carbon fiber sheet is made of UV resistant vinyl that features a carbon fiber textured finish, and the true 3D texture resembles the genuine look of glossy carbon fiber. Some of the highlights of our product are the permanent acrylic pressure-sensitive self-adhesive; the water resistance; the ability to stretch with heat; and at last, but not the least, the long lasting lifetime. 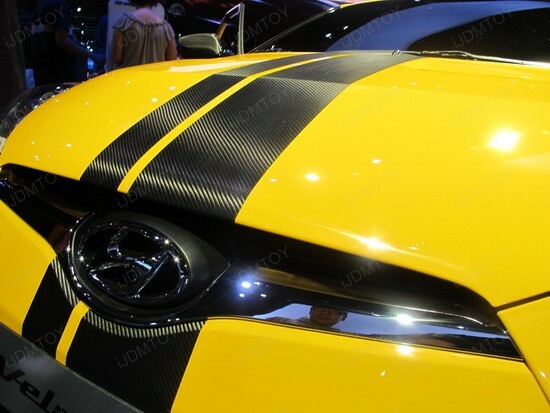 If you are impressed with the 2012 Hyundai Veloster and its elements, wrapped in Carbon Fiber Sheets, then consider ordering a piece. You can use it on various surfaces such as front hood, rear trunk, spoiler, lips, side pillar bars, rims, side mirrors, door handles, windshield, interior trim, etc. 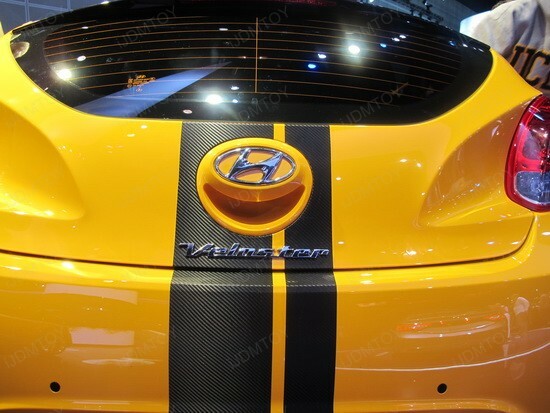 Use your imagination just like the guys, standing behind that bumblebee 2012 Hyundai Veloster.